Preserving our Built Environment | Hutchinson Design Group, Ltd. Saving 85 cents on the dollar is always a good sound to building owners and facility managers! That is exactly what the City of Milwaukee in Wisconsin and School District 73 in Vernon Hills, IL received when they opted to restore their EPDM roofs on the Northwest Garage and Elementary School, respectively. 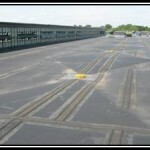 The Northwest Garage is a large vehicle storage facility, which was originally roofed with EPDM in 1994. Inspection of the roof found the membrane to be in excellent condition, but with the roof system having some minor design deficiencies. 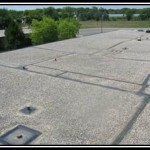 Rather than removing and replacing the roof, it was the recommendation of their RCI Registered Roof Consultant (RRC) to restore and enhance the roof system. EPDM is the only roofing material that exhibits the high level of resistance to ultraviolet radiation, which results in its long-term life and makes restoration a viable option. The “EPDM Roof Membranes: Long Term Performance Revisited” studies by Trial in 2004 confirmed the long-term performance of exposed EPDM by Investigating EPDM roofs that have been in service for the past 16 to 26 years. The roof restoration design called for all the lap seams to be cleaned and cover stripped with semi-cured, self-adhering EPDM cover strips, and the edges sealed with lap sealant. All abandoned roof curbs were removed, all existing roof curbs were reflashed and the baseflashing at the perimeter parapet walls redesigned to “wrap” the wall and be covered with sheet metal copings to render the limestone coping joints water tight. 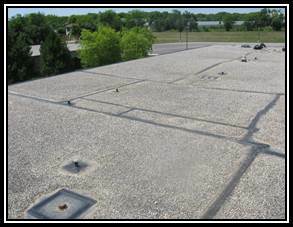 In January 1983, a ballasted EPDM roof system was installed on the Hawthorn Elementary School under the watchful eye of a full time roof consultant. Twenty-one years later that same roof consultant was requested to inspect the roof and let the School District 73 Board of Education know of its condition, and if replacement was required. Inspection of the roof revealed that no roof leaks had ever been reported, but that a number of the building elements that impinge upon the roof, such as skylights and HVAC equipment were beginning to deteriorate. 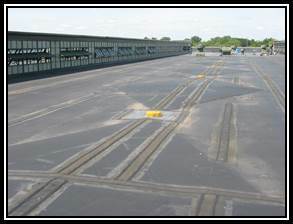 The 45 mil EPDM membrane appeared to be in excellent condition and a sample for testing was taken. Test results confirmed that the EPDM in place on the roof after 21 years of service had material characteristics that exceeded the minimum requirement of membrane being manufactured today. The adhesive lap seams were all found to be tight with no known deficiencies. Some small amount of bridging at vertical wall base flashing conditions was observed. The recommendation to the school,s Board of Education was to restore the roof, with the goal of achieving at least ten more years of service life. The restoration design at Hawthorn Elementary involved replacing all the skylights with OSHA approved for fall protection skylights, redesigning and improving the HVAC intersection with the roof, installation of semi-cured, self-adhering EPDM cover strips over all lap seams, installation of target patches at the roof drains, reflashing of all roof curbs and base flashing conditions, and installing a new cover strip at the gravel stop.